I said in my post, “How to Plan Your Jollibee Party”, that the mascot of Jollibee is always present in any Jollibee party. The country’s fast food restaurant ensured the presence of Jollibee because they know that kids love to see Jollibee in their parties. If you want to know more about Jollibee party, please visit my post about Jollibee party package. From left to right: Yum, Hetty, Jollibee, Twirlie and Popo. Popo loves sports and the outdoors, thus he have lots of energy that can infect the kids. Popo can play any games the kids want be it basketball, game of tag, or jumping rope. So, if you want a Jollibee party that has a lot of games it is best that you invite Popo to your party. Twirlie is the performer in the group. She loves to sing especially to her friends. She is also good in dancing. Twirlie dreams of being a superstar. If the kids want to show their talents in singing and dancing then you should invite Twirlie to your party. Yum is the science wiz of the Jollibee gang. He has a laboratory where he experiments, research and study a lot of things. Yum have a lot of interesting facts to share your kids during the party. Hetty is the cheerleader of the gang. Kids will lighten up once they see Hetty’s rah rah rah chants during the party. These are the mascots that you can invite to your party. Remember that Jollibee is already present. 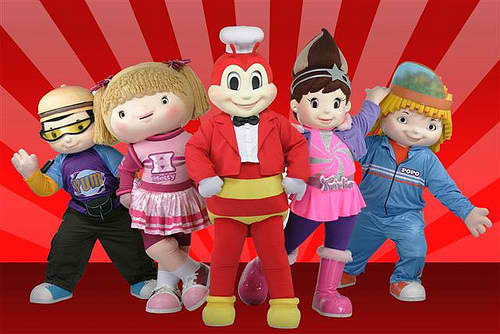 All Jollibee needs is to be with his companions so that your party will be lively and fun. Image of Jollibee mascots came from Ajay's Writing on the Wall. Please visit the Jollibee party website to better plan your party. You can select the Jollibee store that will satisfy your requirements. Wala po yatang Hello Kitty mascot sa Jollibee party. Iam planning a bday party w/ my 2 daughters. how much po for 50 persons where located san pablo city laguna. ung food nya po ay package 2. I suggest po that you use the Party Planner website of Jollibee. The price of food package and add-ons can be obtained from the Party Planner. Can I rent jollibee mascot only? Or order food and mascot in a different venue? I suggest that you ask Jollibee about it. Hindi po pwede. Dapat may kasama pong pagkain.